Since the dawn of the world, alchemical power has always been evident in the environment around us. We find it in our surroundings, in many different plants and objects of nature. The discoveries of these qualities are often credited to the Vidralfer, more commonly known as Wood Elves. These inhabitants of the forest and limb are said to have discovered the art of potion making through the medicinal herbs that their healers collected. The healers used to make a paste or lattice for the injured and sick. According to legend, these lattices were said to have healing power that would cure elves of their afflictions and injuries to a degree. While the Vidralfer are the inventors, we, the magi, are truly the innovators of this art. We have perfected it to a degree so that by use of a mortar and pestle, perhaps a calcinator, and a still, one can create a potion capable of healing, increasing strength or stamina, or many different qualities. The ingredients define these qualities. For example, if one takes a “monkshabit” mushroom, and a strip of wolftail-fish meat, these ingredients, when dealt with correctly, will produce a potion capable of increasing the agility of the consumer for a limited amount of time. This particular potion is popular among thieves, assassins, and acrobats. Some ingredients are stronger than others. For example, the common apple is not near as strong as the Teal Bolette Mushroom. Strong ingredients can actually be chewed like pipe-weed in order to elicit a very basic reaction of sorts. This practice is often times frowned upon, not only for it’s primitiveness, but also for it’s potential danger. If one were to mistake a “Death’s Bell” Blossom for the very similar “Nuns-Hood” Flower, death is almost certain to the consumer. Thus the practice of eating ingredients for the purpose of receiving the mystical benefits is labeled as foolery. Magi in the past have called this foolish practice “Black Gumming”, as the channeling of too many magical elements through the crude practice of chewing causes to the gums to decay and turn a dark, almost black hue. This symptom almost certainly leads to death. Thus, “Black-Gumming” is outlawed and discouraged in Magi circles. Tools commonly used by alchemists vary in size, value, and complexity. The most basic tool of a budding alchemist is the mortar and pestle. Using this, an alchemist can mash and grind elements down to their basic essences. The power or mash produced can further be refined through a calcinator, or a burner of sorts. The mixture is boiled until fluid. Then, the alchemist, if he has one on hand, can run this mixture through a strainer, in order to separate any of the remaining bits of ingredients from the serum. After this process is complete, the serum is commonly run through a still, in order to distill it, and make it semi palatable for human consumption. By the time the potion reaches this point, it has most likely lost much of it’s original flavor. Potions are commonly nasty tasting, and hard to consume. Thus, it is a common practice to mix raw alcohol with the potion, giving it something to disguise the flavor. This is a very strong beverage indeed, and thus potions are only to be taken in very small amounts, such as a vial’s worth or so. It is speculated that the effects of the potion are somehow multiplied by the addition of alcohol to the mixture. There are tales of drunken wizards, who upon taking a potion of rest, a common potion that causes sleepiness and slumber, dropped dead soon after, his heart being stopped by the amplified potion. For this reason, consumers are encouraged to not drink extra alcohol when partaking in potions, as the effects could be harmful, at best when amplified by the large amount of alcohol. 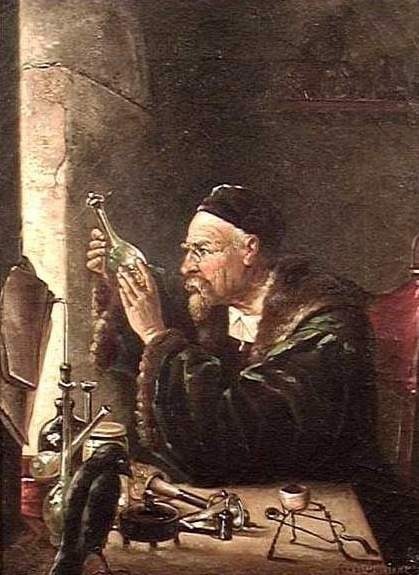 Alchemy can be used to create potions that are healthy, and potions or poisons that are lethal. For such reasons, alchemists are common in elven armies as they are employed as healers and are charged with producing potions for the most wealthy warrior to use. Potion makers are also common among assassins, as a skilled alchemist can create poisons for paralysis, unconsciousness, and even death. The art of alchemy has many roads to travel on. Be careful to choose wisely, and to keep in mind what is right. In the next chapter, I will discuss some of the most popular elements to be found in the jagged edge, around our stronghold, and some of their known properties. Edited by Bobafettmaniac, 17 May 2013 - 04:28 AM. I always liked figuring out the way fictional stuff works. This is really cool. When you finish, you should make a list of recipes. That would be awesome. Oh no, it's Sauron! Act natural!